Herding dogs are incredibly smart and highly energetic breeds that have watched over cattle and other farm animals for centuries. Guardian dogs slowly gave rise to early herding dogs who were bred by shepherds in Europe until they became more common throughout the continent during the 17th century, especially in northern France and Britain. Today, herding dogs have taken over the world and their popularity transformed them from coveted farm companions to family dogs who are intelligent and hard working. Herding balls are a must-have item if you have a German Shepherd or a Lassie lookalike in your household. These balls were especially designed to cater to their herding instincts and are a great addition to their toy box. Our guide below will help you choose the best dog herding ball for your pooch and will also answer the most frequently asked questions related to this quintessential toy. The number one spot on our list belongs to none other than the Push-n-Play herding ball from Jolly Pets. Every dog deserves a safe and durable toy to play with, and this ball is no exception. The best thing about this large indestructible dog ball is that it was designed for outdoor fun and can be used by large dog breeds who will have a blast herding it around the yard. It can also be filled with water or sand to give your highly energetic pooch the workout he deserves. Summer is the perfect time to bring out the kiddie pool to help your dog cool off and watch his Push-n-Play ball float above water. If you have an energetic German Shephard on your hands or a tall Great Dane, then this 14 inch ball can be the perfect playtime companion for your pet. The hard plastic ball from Doggie Dooley is virtually indestructible and caters to the herding instincts that live inside certain dog breeds. If your pooch takes pleasure in destroying and shredding small balls, then buying him this heavy duty ball will direct his energy towards herding it and pushing it around the yard. This toy is made of thick polyethylene plastic and was built to last. Both its weight and size makes it ideal for large dog breeds who will benefit from the extra workout session it provides. Next on our list is the Boomer Ball from The Company of Animals who have decades of experience in dog training under their belt. Their product was designed for breeds who are big fans of chasing and conquering their toys. Breeds such as Boston Terriers, pugs and Pekingese will have a field day with the Boomer Ball. Tough dog toys such as this one are also used to keep animals such as elephants and polar bears entertained and mentally stimulated. 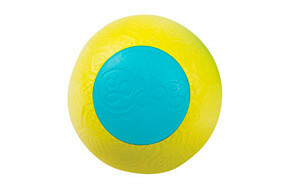 Investing in this ball will help keep your pooch busy and active during the day. The Boomer Ball will also put your mind at ease and stop you from worrying about your dog accidentally swallowing his toys. All you have to do is buy the correct size for your pooch so he can make the most out of his unbreakable ball. There are 5 different sizes to choose from. The small 4 inch ball is ideal for dog breeds like the Cavalier Spaniel and the 10 inch ball is large enough to entertain Great Danes and Bull Mastiffs. Join your pooch for an afternoon of fun and games with this large soccer ball from Jolly Pets. This versatile ball allows you to play fetch with your dog in the yard without having to stock up on balls. This Jolly Pets product is made of a special flex material that helps preserve its shape even after it gets punctured. Having a durable ball at your disposal means less money spent on replacement toys and more time spent bonding with your pooch. This feature makes it possible to keep playing with the ball without it losing its round shape. Summertime is also a great opportunity for you to play a game of catch in the pool using this floating toy. 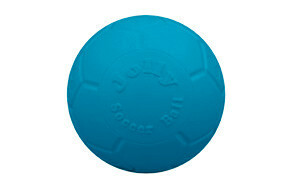 The Jolly Pets soccer ball comes in three different colors with two scented options as well. The orange ball smells like vanilla and the green option is apple scented. The Beast Junior from goDog is a durable ball designed for tough play and this durability makes it one of the best dog herding balls on the market. Both strong and lightweight, the Beast is made of tough molded nontoxic pop foam that prevents it from going flat. This interactive toy was built to last and can be used in the pool or during playtime in the yard. All goDog products are made with your dog’s wellbeing in mind and the environmentally friendly manufacturing process reflects their commitment to safety. The Beast Junior is ideal for small dogs and has a diameter of 4 inches. Herding dogs can be a handful if you lack the right tools to deal with their behavior. These dogs are bred to herd sheep and cattle in farms. Herding can take on many forms including nipping at the heels of animals or even staring them down. Just because a herding dog like the Australian Shepherd was not raised in a farm does not mean that his herding instincts will disappear. Fortunately, herding balls were created to cater to this instinct, but there are certain things that you need to consider before buying one for your pooch. 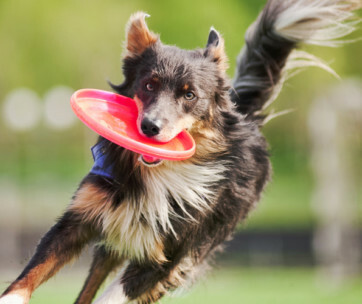 Herding dogs are incredibly smart, highly energetic breeds who need their very own tough dog toys to keep them thoroughly entertained in the yard. These toys come in the shape of round, durable balls that were specifically designed to make backyard herding possible for your pooch. Giving your dog the chance to release his pent up energy on herding balls will prevent him from nipping at your heels and chasing after cars and bicycles. These balls are typically made of tough polyethylene to stop your dog from biting them and tearing them to shreds. Some of them have a glossy surface that prevents dogs from picking them up and chewing on them. Non-toxic balls can be the perfect afternoon companion for herding breeds who need to a toy to push around within the safe confines of your garden. When shopping for a herding ball for your pooch, there are several things you need to consider. If you have an enthusiastic puppy on your hands, you will need to purchase a ball that complements his size. Balls designed for herding can be dense and heavy at times, so choosing the right one for your pup will encourage him to play with it. Luckily, some manufacturers have come up with a size guide that you can use to check the dimensions of the ball. Generally speaking, Great Danes will find enormous balls worthy of their time and will have a blast chasing them around the yard. In contrast, smaller breeds will find happiness in equally small balls that they can easily herd and bark orders at during playtime. 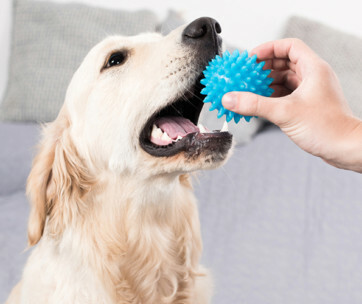 Dogs love to chew on things, and balls are no exception. Their passion for chewing can get them into trouble and can also put them at risk of swallowing small shards that often become choking hazards. Playtime should be about having fun and exercising using safe, unbreakable toys, and this is where herding balls can come in handy. Indestructible dog toys can be lifesavers when it comes to smart and highly energetic dogs who can cause a ton of damage when bored. Fortunately, the cure for boredom comes in the shape of heavy duty balls that were specifically built for outdoor use. Tough herding balls can be used in swimming pools and gardens. Their durability makes them the toy of choice for Australian Shepherds and other breeds who need a long-lasting toy to shove around the yard. Puncture proof balls are also available in case you needed a bouncy ball capable of surviving your pooch and his sharp teeth, especially during playtime. Weight is one more thing that you need to consider before buying a herding ball for your dog. A lightweight ball can be fun and appropriate for indoor use if you have a basement or a special playroom where your puppy can practice his herding habit. Similarly, large dogs require a ball that is compatible with their height and weight. If a ball is too small for herding, they will grow bored of it and will probably start looking for something else to chase. Herding balls can be slightly altered in terms of weight and made to wobble using sand or water. These balls are usually fitted with plugs so you can easily fill them up and use them to give your energetic pooch the workout he deserves. Heavy, water-filled balls inject more fun into playtime because they tend to move slower and this wobbling effect can be attractive to herding breeds. Keep in mind that these balls are not made for kicking or bouncing. If your pooch gets fixated on the plug and tries to chew it off, then buying him an ordinary herding ball is the way to go. Heavy balls are also not designed for indoor use and can collide with your furniture or tumble down the stairs and injure someone, especially if they were large and filled with gravel. Playtime is synonymous with toys and fun. Giving your pooch the correct toy will keep him entertained for hours on end. It will also keep him away from your volleyballs, tennis balls as well as furniture and expensive leather shoes. Herding balls offer a wealth of benefits for your dog including providing him with a safe and toxic free outlet for his herding behavior. Teeth, especially those belonging to dogs can leave a trail of destruction in their wake, especially in the absence of chew bones and other teething toys. Premium herding balls for dogs are the best product money can buy in terms of durability and longevity. Highly energetic pups can sometimes damage their toys beyond repair and this means dog parents will have to replenish their toy box with replacement toys on a regular basis to make up for this loss. Herding balls will save you money in the long run since they were designed to be knocked around the yard. They also have a bite-resistant surface that dogs will have trouble sinking their teeth into and are too big to be chewed on, which makes them the balls of choice for herding dogs everywhere. Chewing, digging holes in the yard and excessive barking are all behavioral issues that appear in the absence of adequate physical and mental stimulation. Herding dogs were originally bred to steer cattle and sheep, so they are competitive and hardworking. 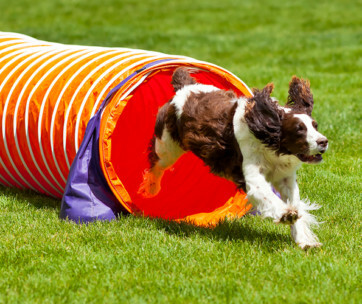 These traits makes them the perfect fit for agility training and other canine sports where they can put their skills to good use. Dog breeds such as Border Collies and German Shepherds will benefit greatly from herding balls since they will be able to express this behavior in the safety of your own backyard. Indulging in this activity will stop your pooch from herding pets and children or chasing after moving vehicles. 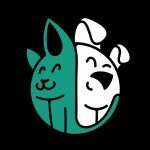 The recipe for maintaining a healthy bond with your pooch includes many positive ingredients such as love, trust and carving out enough time to spend with your dog on a regular basis. Herding balls that double as soccer balls are the perfect bonding toy and can be used to play catch in the swimming pool during summer or you can simply kick them around the yard while your dog chases after them. You can also bond with your pooch via a game of treibball. Herding balls are available in a wide range of sizes starting from small 4-inch balls that were designed for small dog breeds such as Cavalier Spaniels. Enormous 14-inch balls are on the opposite end of the size spectrum and those were tailormade for large dog breeds including Great Danes and Mastiffs. Generally speaking, herding balls are supposed to discourage your pooch from chewing them due to their large size. Reading the manufacturer’s size guide beforehand will help you select the right herding ball for your dog. Q: What is a dog herding ball? A: Herding balls offer an alternative to fragile balls that eventually get punctured or torn to pieces by overly enthusiastic dogs who get carried away during playtime. Tough, puncture-proof herding balls are the solution to herding dogs and athletic breeds who love chasing after their toys and controlling the way they move around the yard. Sharp teeth have finally met their match thanks to this innovative take on the average doggie ball. Q: What kinds of dogs should use a herding ball? A: Dogs who indulge in destructive behavior due to lack of mental and physical stimulation need a toy that will curb this behavior. Herding dogs can end up hurting family members by nipping at their heels and barking at them in order to fulfill their herding instinct. These balls were meant to provide them with an outlet for this natural instinct. Otherwise, they will bark, chew and destroy your house out of boredom. Q: How can I train my dog to herd a ball? A: Training your dog can be easily accomplished using his favorite herding ball and a few poles that double as a goal. First, you need to train your dog to touch your hand in exchange for treats. Next, attach a post-it note to that same hand and use your established reward system to make him touch it. One he gets used to the idea, you can attach the same note to the herding ball. Reduce the size of this note every time your dog successfully touches it until he learns to touch the ball without the note. Use verbal commands to encourage him to move the ball either in your direction or away from you. Remember to use treats during this training session. Once your dog masters the skill of moving his ball around, you can add other balls to the mix until he is able to put all eight balls in the makeshift goal. 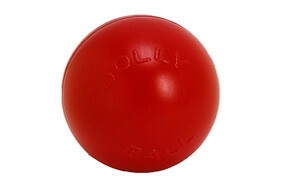 Durable, practical and safe are three words that can be used to describe the Jolly Pets herding ball. Its 14-inch size makes it the ideal playtime companion for large dogs who need their daily dose of exercise to keep them healthy and entertained. This large indestructible dog ball was designed to survive summer games in the pool and is guaranteed to keep your pooch busy in the yard. All in all, this Jolly Pets product is a must-have for herding dogs who need a reliable ball to play with every single day.